The Lycian coast is named after the many Lycian cities dotted along its shores. The stretch from Marmaris to Göcek and Fethiye forms the western part of the whole Lycian coast (Lycia in ancient times) that extends further east towards Antalya. The area which covers Fethiye, Kas, Antalya is known as the east Lycian coast. The whole Lycian coast abounds with massive mountain ranges, above 3 km in the Akdag and Bey Dag peaks. Most of its wild and sequestered atmosphere can be explained by this rough orographic terrain. Not long ago the only practical means of transport was by sea: It took till the 1970's before a proper coast road - cut through the mountains - finally replaced the unpaved paths. Herod held that the Lycians came from Crete, yet archaeological finds and other historical show no records of any cultural or political relationship between the two areas. 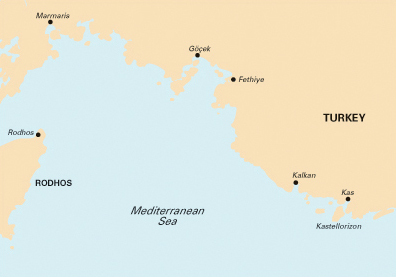 In fact, Egyptian sources (~1300 BCE) mention a people called Lukka along these coasts as enemies of the Pharaoh, which corroborates the theory that the Lycians where endemic to Asia Minor. In the Lycian society, women were held in high respect. Herod even tells that - when asked to which family he belongs - a Lycian would state the lineage of his mother. Moreover, children of a female civilian where free even if their father was a slave! The regions of both the west and east coast of Lycia are wild and rugged, with perhaps the most impressive display of mountains, cliffs and ravines along the whole Turkish coast. 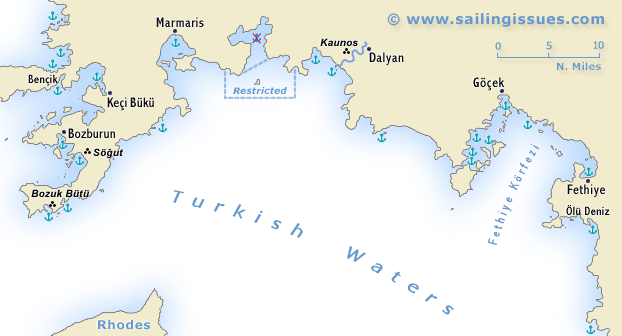 These waters are indeed less friendly than the Carian and Ionian coasts - and were even feared by the ancient mariners - but the majestic sceneries make up for it, also the many coves and bights provide safe and beautiful green anchorages. 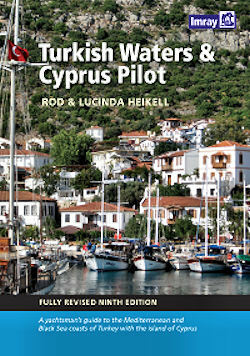 Guide to the coast of Turkey from the Bosphorus to the Syrian border and Cyprus has been updated and improved throughout.